Outside the migration season Birding in Georgia can also be very rewarding. This winter Peter Adriaens and Chris Gibbins visited different birding spots along the coast of Georgia and enjoyed some very spectacular sightings, while they were accommodated in one of our BRC guesthouses, open year-round. A big surprise is the first record of Buff-bellied Pipit for Georgia. Read the full trip report below and enjoy the beautiful photos. Are you also interested in exploring the natural taste of Georgia? Batumi Birding facilitates trips to different parts of Georgia upon request, or you can still take your seat in one of the expeditions. Batumi in Georgia is famous for its millions of raptors in autumn, so Chris Gibbins and I decided to go there… in winter, so as not to be distracted by all those birds of prey! One has to set priorities, and gulls were our main focus. We visited not just Batumi but the whole Georgian coast, from Chorokhi Delta to Anaklia close to the border with Abkhazia, from 22 January to 2 February 2014. The most interesting sites for us were the harbour of Poti, the beach just to the north of it (right beside the APM terminal), and the Chorokhi river (including the Batumi landfill). Always start the day with a coffee break! The birding was quite scenic, with a peaceful Black Sea against a backdrop of the Caucasus mountains. The photo was clearly taken on one of our first days, judging from the spotless state of our rental car – after a few days of driving on beaches and rubbish dumps, it looked *different*. Batumi rubbish dump is a cosy place: friendly cows, inquisitive goats, lots of clementines everywhere – quite like going to the animal farm really. Oh no – a raptor! 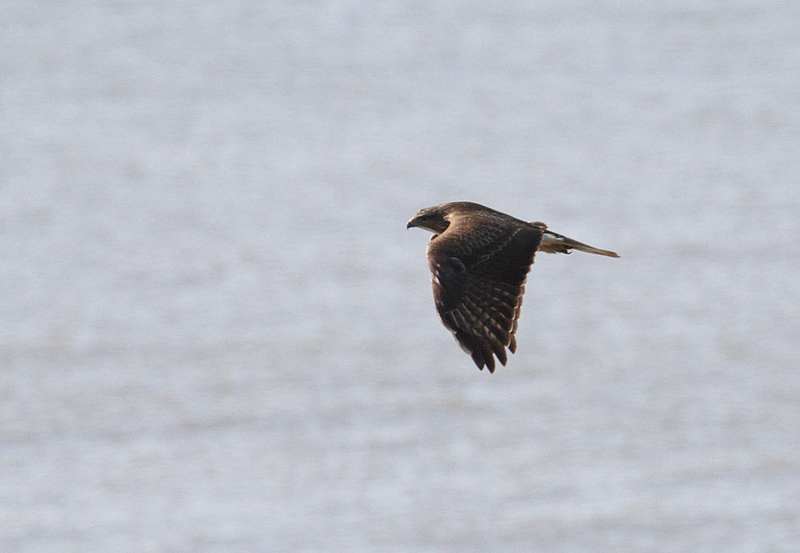 Chasing away all our gulls was this juvenile Black Kite circling over the rubbish dump. The barring on the inner primaries is unusually black-and-white, perhaps suggesting some influence of Black-eared Kite (Milvus [migrans] lineatus), but otherwise this looks like a pretty normal nominate migrans to me – unlike many other Black Kites in the Caucasus region… Note, for instance, that the iris is already turning pale. We saw several Common Buzzards each day and, surprisingly, they all looked like the nominate buteo!? The map in the Collins Guide shows the wintering range of buteo reaching the western shore of the Black Sea, but Georgia is easily a 1,000 kms further east. Has the winter range expanded? Here is an example of one such (juvenile) Common Buzzard, which we saw at Anaklia. We saw a total of 68 Dalmatian Pelicans over the whole trip, including a flock of 41 birds. World’s dodgiest bridge… Chris risking his life for a few (mediocre) shots of Common Gulls. The adult Slender-billed Gulls had all acquired their incredibly pink breeding plumage. This one was not so pink though… A leucistic Slender-billed Gull that hung around Batumi city. Little Gulls (of various ages) relaxing in Batumi city. Standing around on a rubbish dump can be fun when this comes flying overhead: adult Pallas’s Gull in full breeding plumage! We also saw a first-winter bird, on Poti beach. We photographed a total of approximately 90 Armenian Gulls (of all ages) over the whole trip. We also photographed 10 Herring Gulls and saw another 5. We had not really expected this species, but there have actually been about 20 confirmed records in Georgia. A first-cycle Herring Gull in Poti harbour. Looking a bit like a white morph Southern Giant Petrel (which would be quite good for Georgia…), this is a leucistic Caspian Gull, photographed at Poti beach. Other gulls that we saw were a few hundreds of Common Gulls (subspecies heinei) and Yellow-legged Gulls, four Baltic Gulls (Larus fuscus fuscus), and a few tens of Heuglin’s Gulls. Also, we photographed three adult gulls that looked identical to Steppe Gull (Larus [fuscus] barabensis) in all respects. This taxon, however, should be in the Persian Gulf or India at this time. Putative barabensis, adult, Batumi landfill, 2 February 2014. Three Bewick’s Swans (together with a few Whooper Swans) at sea close to the Chorokhi river mouth were noteworthy - a species of which there have been only about 10 confirmed records in Georgia, two of which were also in winter 2013-2014. Two Greater Spotted Eagles (near Rioni river mouth) and a White-tailed Eagle were also very welcome on our trip list, as were the many Yelkouan Shearwaters and Black-throated Divers visible at sea. Yours truly trying to focus in the gull blizzard at Poti… Photo taken by Chris. Many thanks to Brecht Verhelst, Alexander Abuladze and Luba Balyan for their help with this trip.